Call our Admissions Team or fill out our Online Form to enroll. Our Main Campus and original school is located at Republic Airport (KFRG) in Farmingdale, New York. Situated on Long Island, a 30-minute drive from new York City, Republic Airport is just minutes away from JFK International and Spadaro Airports. Between these two airports, your flight training here will make you capable of (and comfortable with) flying into complex controlled airspace like JFK, and show you what it is like to be landing at an airport where you are the sole arrival and departure of the day. Take off and land on 11,000 foot runways and grass strips - a great way for you to jumpstart your flight training. Also, just minutes to the north, we have mountains and many different types of terrain for you to familiarize your self with; an integral factor in your comfort level at the controls of an aircraft is knowledge and recognition of your surroundings. We feel this locale is absolutely perfect for everyone, from first time flyers to long time pros. At Academy of Aviation, we are dedicated to providing an enriching, hands-on education to our students - at a reasonable price. Academy of Aviation takes pride as professionals, and the commitment to providing you a better learning experience. Academy of Aviation's Farmingdale campus is located in a modern and spacious facility in the main terminal of Republic Airport. Our staff will always meet you with a smile and attend to all your questions before, during and after your training. We have our own airplane maintenance staff so you never have to wait or reschedule because of airplanes waiting for technical service. We are more than a place for getting a pilot license. 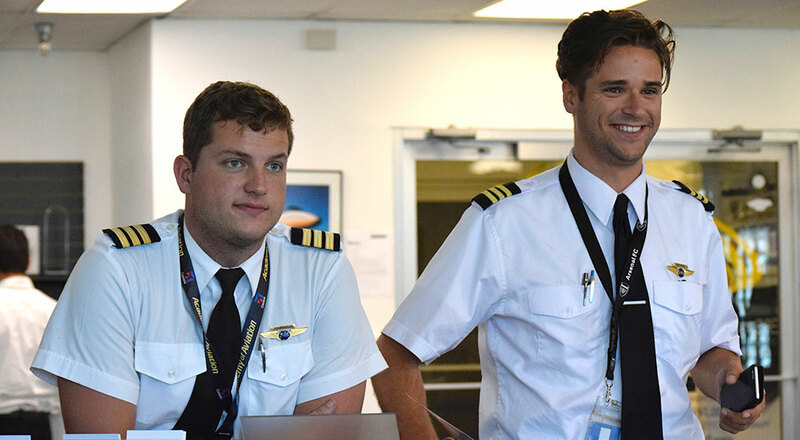 At Academy of Aviation you will not only become a fully qualified pilot, but you will also meet with some of the people who are running the aviation businesses of today and tomorrow. You will have the opportunity to learn firsthand what to expect in your future careers and what the aviation business is beyond the flying. Our past students and instructors are routinely returning to our school to pass their newly gained experience on to people like you who are eager to make the jump and spread their wings. If you're researching flight schools New York, NY area then you've landed in the right place... literally! Contact our Admissions Department today to schedule a campus tour or test drive our fleet by booking an introductory discovery flight. Republic Airport Farmingdale, New York, KFRG - map and directions. Why Choose Academy of Aviation? Convenience and Flexibility. There is a growing demand for professional airline pilot training and recreational flying lessons in NY and we are here to support you in whatever your pilot license aspirations may be. Our flight school prides itself in offering flexible scheduling for customers with a busy work or school schedule. We map out your flight lessons to keep you progressing quickly without compromising efficiency or safety.